Nisakathakadi Kashayam is a decoction prepared from some herbs that acts on urinary system. It also has antidiabetic and antihyperglycemic properties. It lowers blood glucose level and improves insulin function by reducing insulin resistance. In addition, it is also helpful for preventing diabetic complications including diabetic nephropathy, neuropathy and gastroparesis. It is also an effective solution for excessive micturition that occurs due diabetes mellitus. Moreover, Nisakathakadi Kashayam serves antioxidant and anti-inflammatory actions. Prepare a coarse powder of each ingredient of Nisakathakadi Kashaya. Now, take 60 grams Nisakathakadi coarse powder and 960 grams water. Boil the mixture and reduce liquid content to 120 grams i.e. 1/8th part of the liquid added for the preparation. Remove it from the heat and filter the Nisakathakadi decoction. Use it according to dosage described below. Note: Nisakathakadi Kashayam is also available in form of readymade decoction and tablets in the market. One can also use that as per dosage described below. 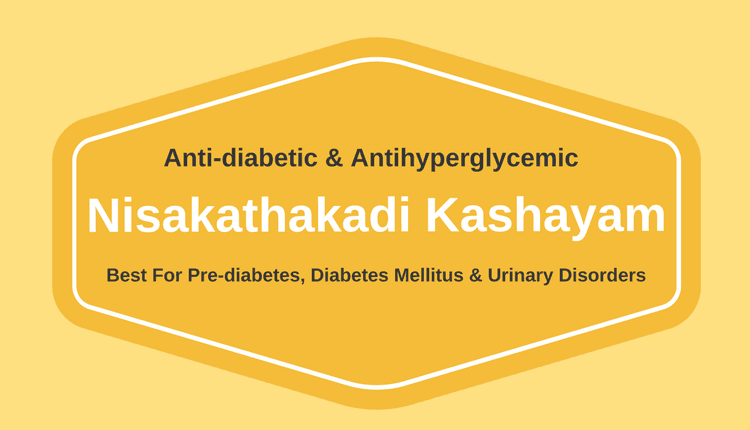 Nisakathakadi Kashayam benefits in diabetes mellitus are attributed to its antidiabetic and antihyperglycemic characteristics. Mainly, it acts on insulin resistance. It improves insulin function by reducing cellular resistance for insulin. It helps insulin to get into cells, which improves the use of available insulin in the body. It also contains Gurmar herb that stimulates the release of insulin from the pancreas and improves pancreatic functions. This Kashayam can be given as adjuvant to several other anti-diabetic medicines for enhancing their therapeutic actions. It is commonly used along with Amritamehari Churnam to reduce blood glucose level. Along with Nisakathakadi decoction, Vasant Kusumakar Ras, Chandraprabha Vati, Yashad Bhasma, Shilajit etc. can also be used for the best results. Nisakathakadi Kashayam also helps to reduce the excretion of sugar in the urine, so it helps to treat glycosuria. It also helps to reduce excessive urination in diabetic patient. However, it is used along with , Chandraprabha Vati for getting the best results. Nisakathakadi Kashayam potentially slows down the development of diabetic complications. It has protective action against kidney disease, neuropathy, and diabetic ulcers. Its ingredients especially turmeric alleviates low-grade inflammation, which is responsible for the most of complications. If you are using Nisakathakadi Kashayam Churna, then take 60 grams churna in 960 ml water. Boil to reduce it 120 ml Nisakathakadi liquid. The dosage is 30 to 60 ml. The general dosage of Decoction (Kwath) prepared with Nisakathakadi Kashayam Churna is as follows. Nisakathakadi Kashayam Liquid is readymade concentrated decoction and can be used in the following dosage. The general dosage of Nisakathakadi Kashayam readymade Liquid is as follows. Nisakathakadi Kashayam Tablets are the extract tablets of the Nisakathakadi decoction. The general dosage of Nisakathakadi Kashayam Tablets is as follows. Note: The dosage is according to 1000 mg tablet of Nisakathakadi Kashayam. Nisakathakadi Kwath is Likely Safe & Well Tolerated in the most people when above points are considered wisely and taken as per its indications in appropriate dosage under professional supervision. There are no side effects reported with Nisakathakadi Kashayam. There are no absolute contraindications for Nisakathakadi Kashayam. The safety profile of Nisakathakadi Kashayam is not well established for pregnant women and lactating mothers. Consult an ayurvedic physician before using Nisakathakadi Kashayam during pregnancy and lactation.